Santa is heading out to do what it is he does every Christmas Eve, deliver presents to all the good girls and boys. Then disaster strikes. The reindeer and the sleigh get separated and Santa crash lands into a barn. With no reindeer to fly the sleigh how will he be able to deliver the presents? 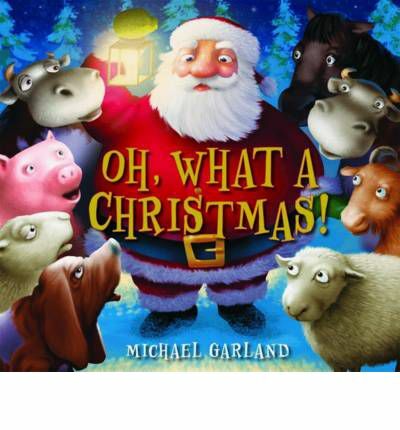 When a dog, a pig, a goat, a horse, two sheep and two cows come out to investigate, Santa gets a great idea. This is an enjoyable little spin on a Santa story. It is full of many of the Christmas staples – presents, helping hands (or animals in this case) and Santa over coming a problem. The illustrations are kind of fun and everything seems rounded and jolly. Yes it is another Christmas picture book but it is a sweet little story so if you are sick of reading the same ones over and over this is worth a look.